NOTE: The Blue Ridge Orchestra concert referenced in this story has been rescheduled for 5pm Jan. 13, 2019, in Lipinsky Auditorium, at UNC Asheville. 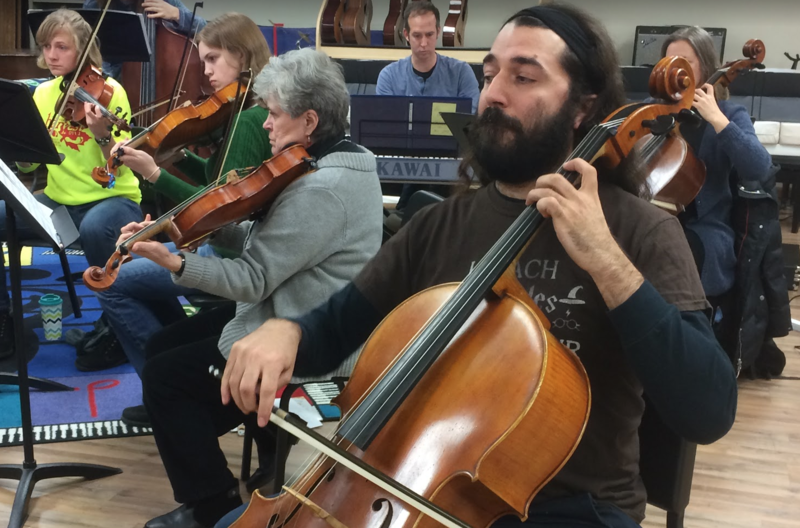 It’s an early December evening, and cellist Franklin Keel is rehearsing with the Blue Ridge Orchestra. He’s the featured soloist in their upcoming program, and he wants to hear this Vivaldi cello concerto in a particular way. Just from this window, you might see Keel as an exacting musician. In a conversation the following day, he insisted that’s far from the case. Franklin Keel rehearsing with the Blue Ridge Orchestra. Keel has been a member of the orchestras in Hendersonville, Brevard, Bristol, Tenn.; and since 2004, the Asheville Symphony. Keel says none of that would have happened if he hadn’t turned his love of playing the cello into a studied and practiced craft. Even after graduating the vaunted Eastman School of Music, Keel said he needed another four years of intensive study to refine his technique. In particular, he said it took him a long while to consistently hold his bow in a way that leads to efficient performance. Keel is the oldest of four boys in a family, and he was a fifth-grader when they moved from Concord, N.C., to Asheville. By the time he was in high school, he was performing duets with his father, an amateur violinist. His love of Vivaldi ran along a parallel track with an appreciation of grunge and other popular music from the early ‘90s. For all his battles with technique, Keel has fought through the rejections of auditions. In Asheville, he auditioned three times for the associate principal cello chair before landing it, and even after 2½ seasons as the acting principal, he has never won the position outright through auditions. Still, he insists he’s never been interested in the upward career track of classical music. Keel looks somewhat like the British actor and comedian Russell Brand, and he’s known to show up to orchestral rehearsals wearing a tie-dyed shirt and Birkenstocks. It’s yet another element of Keel’s unorthodoxy. Beyond his orchestral work, Keel is a member of the Opal String Quartet and the eight-piece gypsy folk funk band Sirius.B, along with writing and performing his own music under the name Upland Drive. If you missed Keel’s performances with the Blue Ridge Orchestra this past weekend, you can see him perform with Upland Drive Dec. 16 at Isis Music Hall. Sirius.B has a New Year’s Eve show at Jack of the Wood in Asheville. Most people associate the Brevard Music Center with summer classical concerts featuring world-class performers in an open-air auditorium. Away from the spotlight, about 400 teens and twentysomethings come from around the country to spend most of their summer studying classical performance at Brevard Music Center. “I’m totally illiterate when it comes to pop culture, because my head is in classical music,” said Myles McKnight, an 18-year-old violinist from Hendersonville.